Kitchen Design Centre Welcomes New Faces! The talented team of designers at Kitchen Design Centre are always ready to talk you through the stunning kitchens on display. Now, we’ve welcomed three first-rate design assistants to the Kitchen Design Centre family too! Meet the new faces below! Currently undertaking a BA in Contemporary Design for Interiors at Blackburn University Centre, Diane is a well-travelled woman with a passion for innovative home style. Diane works with the kitchen designers at our Blackburn kitchen showroom, supporting them in delivering stunning visuals to customers and completing the administrative work that’s part and parcel of running a designer kitchen studio. “Kitchen Design Centre’s a great company with a reputation for providing outstanding kitchens to its customers. They stand apart from other kitchen companies because of the quality of the kitchens and the designs, not to mention the customer service. 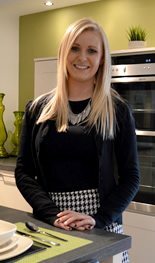 A recent addition to our Colne kitchen showroom, Emma graduated last year with a first class degree in Interior Design. 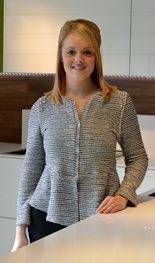 She assists our team of designers in drawing up floor plans, producing quotes and liaising with customers. “Kitchen Design Centre has given me a great opportunity for me to enter into the design industry. Working as a design assistant lets me show off my design/CAD skills while learning new things. I’m able to apply fresh design ideas to visuals, meet new people and use my product and design skills when talking to customers. 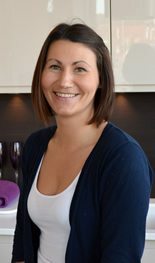 Design-savvy Emma isn’t just a whizz when it at kitchen design – she also loves baking, describing cakes as a form of therapy! Lucy, who assists the kitchen designers at our Manchester showroom in generating leads, checking samples, completing orders and creating 3D visuals, feels that Kitchen Design Centre’s attention to detail and great customer service are just two of the things that set us apart from the competition. Citing meeting new people as one of her favourite things in life, Lucy is a friendly new addition to our Manchester branch. A passionate globe-trotter, she’s keen to experience new things and think outside the box, which makes her a perfect fit with our imaginative designers! Can’t wait to get down to our showrooms? Not to worry, you’ll find lots of examples of the kitchens we make on our website. Have a browse, we’re sure you’ll love them all! Alternatively, contact a member of our team to arrange a FREE consultation!